My wander around the back-catalogue takes me to The Sun Makers, a 1977 Robert Holmes story for the Fourth Doctor and Leela. I last watched it nearly 40 years ago, and my few memories were Pluto, Michael Keating and not much else. I did recognise the Dennis Healey like Collector once I started watching. With the benefit of age and another viewing, what are my thoughts? 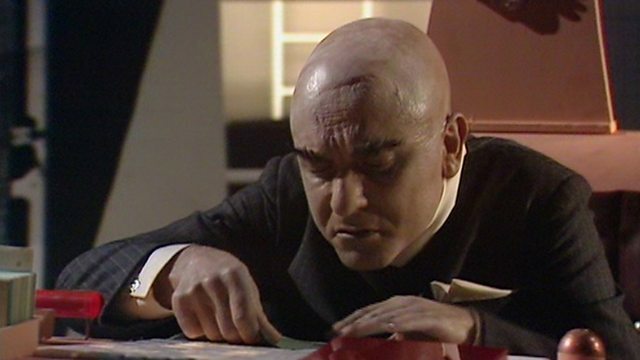 The Doctor and Leela end up on Pluto (OK it looks like an modern building) and find a society of workers exploited by aliens (the Usurians) and whose leader, the Collector (Henry Woolf) has mad eyebrows a bit like the famous 1970s Chancellor Dennis Healey. Society is controlled by the local Gatherer and everybody works to pay their arbitrary taxes. Society is controlled by a gas, but there is an under-society of rebels led by Mandrel (William Simons). Notable amongst the rebels is Michael Keating’s Goudry. The Doctor and Leela get split up, and while the Doctor gets to meet those in power (after a brief spell in a machine to torture him, though he escapes before it is used) Leela is captured and sentenced to death. She is rescued by the Doctor and they proceed to bring down society, free the rebels, remove the gas, defeat the Collector and point humanity back to Earth. A great result! The sets are a bit basic in places, and the Pluto setting didn’t work visually at all. The acting was somewhat wooden, but on reflection this is when the controlling gas is at work. The corrupt self-serving team around the Gatherer are one-dimensional and weak, but this makes the story work. Some exceptional performances from Simons and Keating, while Woolf’s Collector is suitably mad and disdainful. The Doctor does enough to win through, but leaves plenty of space for the secondary characters. Leela is good in this story, she has plenty to do and Louise positively beams in many parts of the story. This fits with her comments elsewhere as to this being a favourite adventure. It’s a standard story of an outside catalyst (the Doctor) destroying a bad society and saving the day. It’s a bit formulaic for that yet rather more enjoyable than I had remembered it. I’m glad I watched it again.